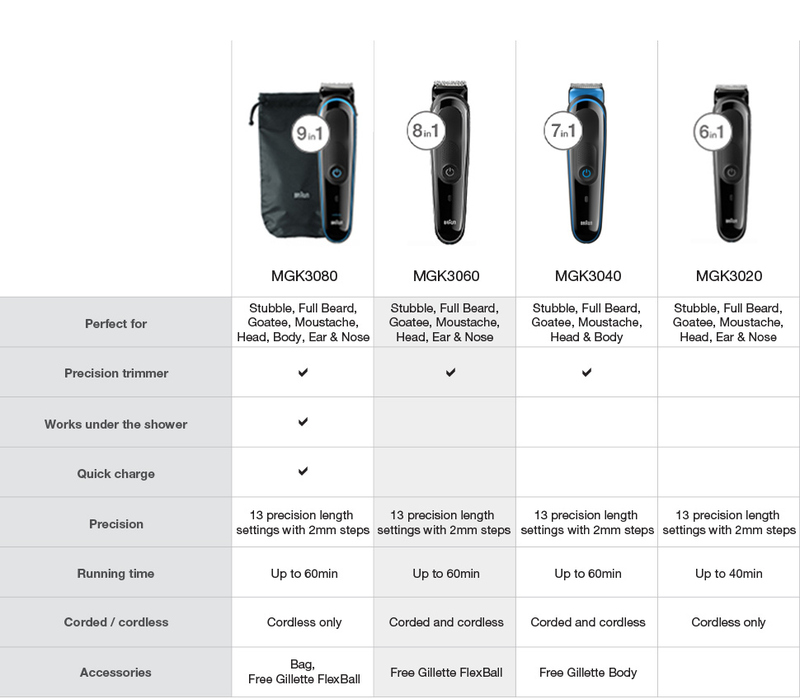 Male Grooming Kit 8-in-one precision Face/Head Trimmer with free Gillette Fusion ProGlide Manual Razor is rated 4.7 out of 5 by 32. Rated 1 out of 5 by CountryMick from Very Disappointed This was replacing a different brand version of the same thing as it was getting a bit old. What a huge mistake that was, it does not cut as well and close. After using it, I had to re-do everything the next day with the different brand I originally had as there were noticeable 'tufts' and areas that didn't trim down properly. I had to re-do under the beard on the neck with the different brand as this model here did not cut neat or trim. Very disappointed indeed. Rated 5 out of 5 by Joshy1992 from haven't looked back since purchasing this product I bought this two weeks ago, and it is amazing!! I haven't looked back since purchasing this product, it arrived three days after purchasing online and gives a great smooth trim down there and up there... if you know what I mean!! It is not too noisy and doesn't pull out hairs like a lot of the other shavers out there. Overall I really recommend this product, whether it is the beard or the weird that is getting shaved, it's got you covered. Rated 4 out of 5 by Axxx from Nice and light and quiet! Bought this for my husband for his birthday, as his old beard and hair trimmer was so noisy, it was driving us crazy. This is perfect - does the job well, very light and very quiet. Being rechargeable means it's a great travel unit too. My only suggestion for an improvement would be to include a case, as it comes in a box that has to be discarded. Rated 5 out of 5 by italian96 from Great Features This is a great trimmer that can do it all. The attachments are very easy to change and the nose trimmer and the precision trimmer attachments are great. The trimmer itself is also very high quality. The only thing i dislike about this product is its battery life, as it only lasts a little over 1 hour, and takes a couple hours to charge. Rated 5 out of 5 by RayRay from An excellent unit Great quality, feels great in the hand, useful attachments which are everything that you need to keep neat and tidy. Handy that it can be washed under running water. My only wish was that there was included a bag, holder or caddy to neatly store everything. Rated 5 out of 5 by Kevin from Has a variety of features So far I'm really happy with my purchase. Light, easy to use with different trimming options. I find thicker facial hair requires going over a few times but overall great value for money.